Test 1: Can My Computer See the FTP Server? Test 2: Is the FTP Server Working? To make a successful connection to the FTP Server during the synchronization process, you need three pieces of information: the URL (Universal Resource Locator), the user name and the password. These three pieces of information need to be entered in the Configure Synchronization screen. The user name and password are assigned by the system administrator of the FTP Server. The first test to perform is to check whether your computer can "see" the computer that is running the FTP Server. You do this by using a PING command in a DOS window (also known as a Command Prompt in Windows XP). PING is a command used to verify that a network connection is working without erros. It is similar to a ship's sonar sending a pulse and measuring how fast it returns. Open a DOS window and enter a "ping" followed by the URL of the computer where the FTP Server is located. When a ping is successful, the computer sends packets of data and receives a reply confirming that the data was received. In the example above, the user pinged the computer at the IP address 192.168.0.100 and successfully sent and received 4 data packets. When a ping is not successful, you will see a message that says "Ping request could not find host...". In the example above, the computer called "laptop" could not be found. 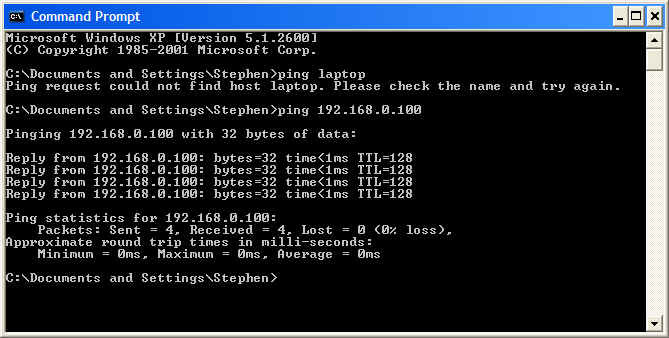 If the ping is not successful, contact your system administrator and resolve all network problems before proceeding. If the first test is successful you have confirmed that the computer cited in the URL does in fact exit and can be accessed from the computer where the test was done. The next test is to confirm whether the FTP Server is working on the computer that was pinged and that the user name and password are valid. To conduct this test, once again you need to open a DOS Window or Command Prompt. If the FTP Server is working, you will be asked to enter a User followed by a Password. If you are not prompted for a User and Password, then the FTP Server is not setup or is not working properly. After you enter your User and Password, you will see a message that you are logged in. If the User or Password are not valid, you will see an error message. Check with your system administrator to confirm you are using the correct User and Password. Once you are logged in to the FTP server, you will see "ftp>" to the left of the cursor. This means that any command written here now will be sent to the FTP Server. For example, you could enter the "dir" command and see the contents of the root directory. If either of these two tests are not successful then the Synchronization process in XpertMart™ will not work.